Quick post here. For those of you who eat or cook poultry this may interest you: Why you shouldn’t wash chicken before cooking – The Times of India. The article discusses the results of a survey done by News.com.au on whether people wash their poultry before cooking it. Seems that this is quite common in some places. The article suggests / implies (though does not present evidence) that this may be counter productive (pun intended). Rather than reducing the risk of infection from something in / on the chicken, this may simply spread chicken associated microbes around the kitchen. 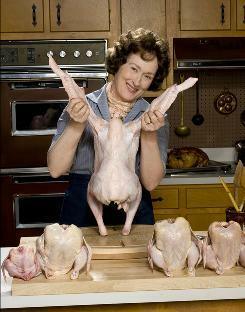 I note – the best way to reduce contamination from chicken and meats in the kitchen – become a vegetarian or a vegan. But otherwise, the best way to reduce the likelihood of problems from microbes in meat is to be careful with the meat, clean anything that touched uncooked meat (including counters, hands, etc) and to fully cook meat rather than wash it. If you want to check out the original stories on the study see: Stop! Don’t wash that chicken | News.com.au. Interesting thought and certainly worth considering. However, I personally wash my poultry not for the bacteria but for any chemical residue or other unsavory elements of processing.